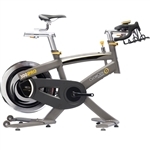 The SportsArt Fitness C530r is a recumbent bike, which means it has a different body positioning than normal bikes. 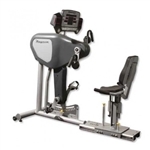 These stationary bikes put the body in a "recumbent" or horizontal position, so that the pedals are at about the same height as the rider's hips. This position allows for a great cardiovascular workout while not putting much pressure on the rider's seat, back, or neck. Because of this, recumbent bikes are great for people with back and neck problems. The C530r features a state-of-the-art tri-color dot matrix display with Personal CardioAdvisorTM for accurate heart rate feedback. Multiple programs keep your workouts fresh. Dimensions: 67" x 22" x 48"